NEW YORK -- From his bed next to the window, Jadon squeezes his father's finger with all his might, even under heavy sedation. Anias rests in a bed near the door of the room, a testament to strength and resilience. "It's shockingly new," said their mother, Nicole McDonald. The boys have shared a bed since birth. 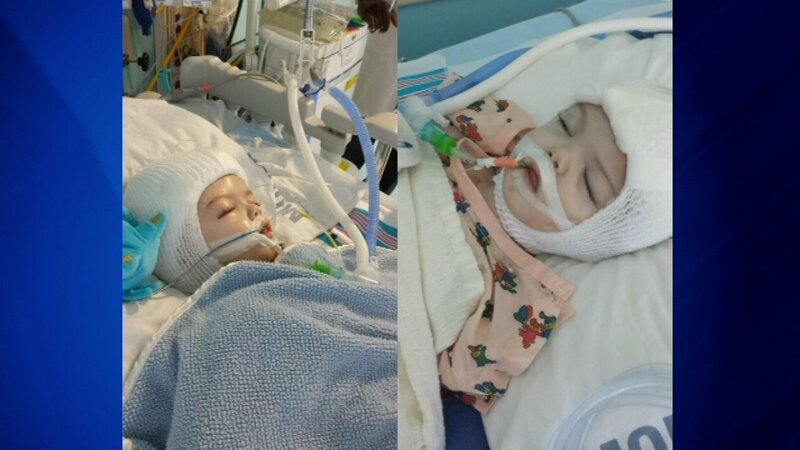 Born conjoined at the head, the 13-month-old twins -- little "warriors," their parents call them -- spent the weekend recovering from the 27-hour surgery that separated them. "I can't wait to put them beside each other and them see each other," said Christian, their father. "To be honest, I'm just so excited and anxious to see that moment. That's going to be a great day." The surgery -- which began early Thursday and ended shortly before 1 p.m. Friday -- took place at the Children's Hospital at Montefiore Medical Center in the Bronx. It was led by neurosurgeon Dr. James Goodrich, considered the leading expert on what's known as craniopagus surgery. The first 72 hours of recovery were most critical for long-term survival, doctors told the parents. Christian said the boys were stable and doing well after a weekend of challenges. Jadon has yet to move his left side. Though that is troubling, Christian remains optimistic. "That's not something really worrying Dr. Goodrich right now," the father said. "He says that's not out of the ordinary. Hopefully, in time, he will start moving that side." Both boys have opened their eyes, although they are heavily sedated and hooked up to an array of medical equipment. They're too fragile for Mom and Dad to pick them up just yet. "Jadon will squeeze your fingers and not let go, on his right side," said Christian. "They're really doing pretty good, considering the surgery they went through." Goodrich and lead plastic surgeon Dr. Oren Tepper said in a joint statement Monday afternoon that "so far, the recovery course has gone as expected." "We are hoping to be able to extubate Jadon in the upcoming days, and Anias we expect to take longer as we work to control his blood pressure issues," the doctors said. They added that both boys would probably have to undergo more reconstruction surgery: "We expect that parts of the incisions on both boys' heads will need some revision." The separation surgery was the fourth procedure for the boys -- and the most complicated. The twins awoke from the first two surgeries after about a week; after the third surgery, it took about a month "for them to be back to themselves," Christian said. He expects a similar recovery this time. "The more difficult the surgery," he said, "the longer the recovery." Dad spent a good bit of time this weekend bonding with the couple's 3-year-old son, Aza, while Mom camped out in the twins' room, loving every second of the reunion. One of the most poignant moments occurred Friday afternoon as the parents waited for Anias to get out of surgery. Jadon had been wheeled out of the operating room about 7 that morning and brought up to the pediatric intensive care unit, or PICU, but Anias' operation was taking much longer. Christian plopped to the floor of the PICU. Nicole bent over in agony. They'd been told Anias would be brought there any moment, but a 20-minute wait turned into an hour. "Come on, little Anias," Dad said. "I can't wait to see you, Buddy." Suddenly, about 1 p.m., medical personnel with dark circles under their eyes emerged from the elevator. Nicole stood with her hands clasped in prayer, Christian by her side. He wiped a tear from his right eye and put his arm around his wife of four years. They'd waited for this moment since the boys were born at 11:11 p.m. on September 9, 2015 -- and even before that, when they first learned in May 2015 that the boys were conjoined in utero. "Hey, Buddy, you look beautiful," Christian said, leaning in for a kiss and blowing on his forehead. "I love you, Pumpkin. You look just like your brother." Two nights earlier, in the same room, the boys had shared one bed. Christian had climbed into it, while Nicole read them the children's book "I Love You All The Same." "You are strong, you are smart, you are happy," Nicole told them as they drifted to sleep. And now here the family was, together. There was even beauty with the exact time of separation, at 2:11 a.m. -- when the two conjoined boys became one and one. Over the weekend, Nicole took to Facebook to thank the "heroes" at Montefiore -- from Goodrich to his nurse practitioner, from Tepper to anesthesiologists, from nurses to volunteers. "As absolutely humbled as I am for all of the encouraging messages I've received, it's hard for me to take any credit for the miracle that these boys are," Nicole wrote. "All I did was birth beautiful, unique children and love them with all I have. There are mothers everywhere who do that on a daily basis. I'd like to direct the attention back to the true heroes of our story." Both parents gave up their jobs and moved from their Illinois town of 5,000 to the Bronx to be near the hospital. They've been relying on donations to make ends meet over the last year, overwhelmed by the outpouring of support from complete strangers. Messages of support from strangers proved a powerful distraction during the hours of waiting while the twins were in surgery, Christian said. He and Nicole said they felt the love and prayers sent their way. They monitored the hashtag #JadonAndAnias as people tweeted about "our beautiful boys." "If it wasn't for all these people sending us messages and donating, we wouldn't have been able to keep such a positive outlook," Christian said. "What I really want to say to the thousands who supported us," Christian said, "is that we are blown away how total strangers can and do love our boys so much. And their love for our boys poured out of them through their messages and donations." And that's something the McDonalds say they will never forget. It's been "a long, hard journey getting to this point," Christian added. "We're finally seeing the fruits of our labors and our long, hard nights." In her Facebook post, Nicole said her family also couldn't have made it this far if it weren't for their faith. "Without God we would have unraveled many, many months ago," she said. "People say we have handled this situation with grace, but it's with God's grace that we continue on."